A newly built property or a refurbished one in Putney, SW15 London will surely be cluttered with debris, dust and grime which was left by the builders. Most companies promise that their workers will tidy up the place, but in most cases the workers forget about this promise and leave you with a dirty and messy place. The type of grime can vary – you will definitely find dust in places you didn’t even imagine dirt or dust can get into. However, the biggest problem is paint splashes – cleaning paint requires the usage of strong chemicals which can easily harm furniture and surfaces. Your best solution is to contact a professional cleaning agency which can clean everything professionally and know how to treat paint splashes without damaging furniture, appliances or surfaces. Our cleaning agency is called Cleaners Putney and provides professional after builders cleaning services in Putney, SW15 London. Removing all paint stains and throwing out debris, plaster, etc. 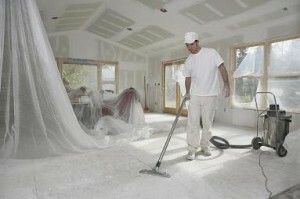 Our agency doesn’t specialize in just after builders cleaning. Our teams are qualified to perform all kinds of cleaning assignments and we offer a variety of cleaning services which can be carried out in the London and Greater London areas. As a reputable company, we provide our workers with the needed machines, tools and products. All of them are included in the price, so you don’t have to worry about extra fees. Each one of our employees has been checked and trained in order to be able to perform all types of cleaning tasks.